This juicer is small in size but powerful in performance. 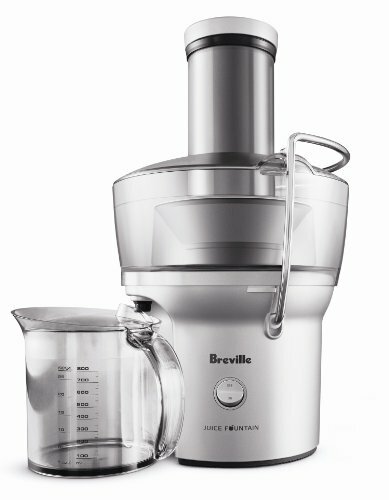 The Breville BJE200XL will make a healthy, nutrition packed juice in five seconds. The extra-large feed chute requires no cutting or chopping of fruits or vegetables. Simply wash and add them directly into the juicer. The centrifugal juicer pushes pulp inward and draws the juice outward. This makes juicing a quick process even in a busy household. No need to worry about overheating with the powerful motor in the Breville BJE200XL. The pulp is stored internally; so that it saves space. The interior pulp container holds just 1.6 quarts, in order to keep the compact size. The juice container, provided with this machine is BPA free and minimizes oxidation and foamy froth, while maximizing nutrients and minerals. This unit disassembles and reassembles easily, with only three pieces to assemble. In addition it makes cleaning an easy task. It is dishwasher safe, on the top shelf. Less hassle to clean when it simply can be placed into the dishwasher. The pulp container inside also assembles easily, after cleaning. Considering it as centrifugal juicer, the operation is fairly silent, with sound levels almost the same as `a standard food blender.